英文摘要：A total of 90 adults (48 females and 42 males) of Feirana kangxianensis from Kangxian, Gansu province were collected and measured. We found that there were significant differences in snout-vent length, head length, head width, snout length, internasal distance, interorbital distance, eye diameter, tympanum diameter, length of lower arm and hand, hind-limb length, hand length as well as foot length between genders. The results of analysis of covariance indicated that there were significant differences in the 11 morphological characters between genders. The index of sexual dimorphism was 0.08 and the average snout-vent length of the females was 9.1% longer than that of males. The linear regression equation between snout-vent length and other 11 characters showed that the females had faster growth rate of snout length, interorbital distance, eye diameter, tympanum diameter, length of lower arm and hand, and hand length than that of males. The hypothesis of the fecundity selection could explain the sexual dimorphism of F. kangxianensis properly. 费梁, 叶昌媛, 江建平. 2012. 中国两栖动物及其分布彩色图鉴[M]. 成都:四川科学技术出版社:480. 贺佳飞, 周伟, 李明会, 等. 2006. 多疣狭口蛙的两性异形[J]. 中南林学院学报, 26(1):77-81. 胡一中, 代亚如, 程岩岩, 等. 2015. 华南湍蛙的两性异形[J]. 浙江师范大学学报(自然科学版), 38(1):23-27. 李成. 2000. 臭蛙类第二性征的多样性与进化研究[J]. 两栖爬行动物学研究, 8:28-33. 李春瑜, 洪美玲, 王力军, 等. 2013. 海陆蛙的两性异形和雌性繁殖特征[J]. 动物学杂志, 48(1):16-21. 李殿伟, 郝婧玮, 金志民, 等. 2014. 中华蟾蜍两性异形研究[J]. 牡丹江师范学院学报(自然科学版), 18(4):35-37. 林植华, 计翔. 2005. 浙江丽水虎纹蛙形态特征的两性异形和食性[J]. 动物学研究, 26(3):255-262. 刘凌云, 郑光美. 2009. 普通动物学(第4版)[M]. 北京:高等教育出版社. 刘洋, 时磊. 2009. 奇台沙蜥生长过程中的两性异形[J]. 四川动物, 28(5):710-713. 施林强, 张秀琴, 马小梅. 2011. 泽陆蛙(Fejervarya limnocharis)两性异形的个体发育和雌体繁殖[J]. 生态学杂志, 30(4):717-723. 赵晓进, 季青, 胡春红, 等. 2006. 太行山猕猴部分活体形态指标的异速生长分析[J]. 河南师范大学学报(自然科学版), 34(4):139-143. Cerit H, Avanus K, 李亨. 2008. 鸟类性别鉴别方法的研究进展[J]. 中国家禽, 30(18):30-33. Andersson MB. 1994. Sexual selection[M]. Princeton:Princeton University Press. Blanckenhorn WU. 2005. Behavioral causes and consequences of sexual size dimorphism[J]. Ethology, 111(11):977-1016. Fairbairn DJ, Blanckenhorn WU. 2007. Sexual size dimorphism in mammals[M]. New York:Oxford University Press:16-26. Gibbons JW, Lovich JE. 1990. Sexual dimorphism in turtles with emphasis on the slider turtle (Trachemys scripta)[J]. Herpetological Monographs, 4(1):1-29. Howard RD. 1981. Sexual dimorphism in bullfrogs[J]. Ecology, 62(2):303-310. Malmgren JC, Thollesson M. 1999. Sexual size and shape dimorphism in two species of newts, Triturus cristatus and T. vulgaris (Caudata:Salamandridae)[J]. Journal of Zoology London, 249(2):127-136. Powell GL, Ressell AP. 1985. Growth and sexual size dimorphism in Alberta populations of the eastern short-horned lizard, Phrynosoma douglassi brevirostre[J]. Canadian Journal of Zoology, 63(1):139-154. Shine R. 1979. Sexual selection and sexual dimorphism in the Amphibia[J]. Copiea:297-306. Shine R. 1989. Ecological causes for the evolution of sexual dimorphism:a review of the evidence[J].The Quarterly Review of Biology, 64(4):419-461. Temeles EJ, Pan IL, Brennan JL, et al. 2000. Evidence for ecological causation of sexual dimorphism in hummingbird[J]. Science, 289(5478):441-443. Wang J, Xie F, Wang G, et al. 2014. Group-spawning and simultanous polyandry of a stream-dwelling frog Feirana kangxianensis[J]. Asian Herpetological Research, 5(4):240-244. Yang X, Wang B, Jiang JP, et al. 2011. 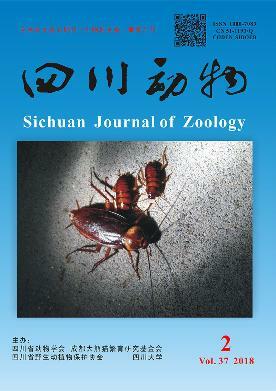 A new species of the genus Feirana (Amphibia:Anura:Dicroglossidae) from the western Qinling Mountains of China[J]. Asian Herpetological Research, 2(2):72-86.